Ottawa  Liberal MP Borys Wrzesnewskyj (Etobicoke Centre) continued to press the Toronto District School Board (TDSB) on its decision to exclude study on the 1932-33 Ukrainian Holodomor (famine genocide) in the recently announced grade 11 course entitled Genocide: Historical and Contemporary Implications. Wrzesnewskyj took to the airways to raise his concerns on the popular John Oakley Morning Show on CFMJ-AM 640. 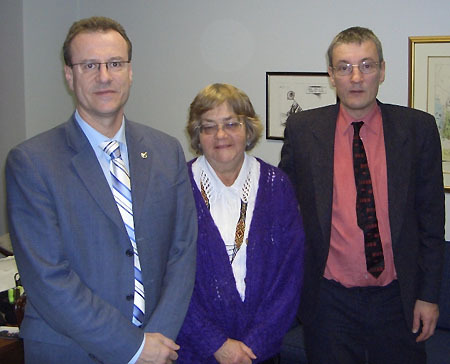 Left to right: MP Borys Wrzesnewskyj with Oksana Piaseckyj, President of the Canadian Friends of Ukraine (Ottawa Branch) and Nigel Colley, the great-nephew of Gareth Jones in Wrzesnewskyj’s Ottawa office. In response to Oakley's question "why are you concerned about this particular curriculum," Wrzesnewskyj began by summarizing his extensive work in the area of human rights and genocide prevention, including his work as an executive member of the All-Party Parliamentary Group for the Prevention of Genocide and Crimes Against Humanity and his lecture and engagement on the issue of genocide with University of Ottawa students taking Professor Dominique Arel's course entitled Political Violence: The Comparative Study of Mass Killing. "...first of all, the Toronto District School Board needs to be congratulated in that they've actually made the decision to teach students about genocide. There are horrific episodes in humanity's history and the most horrific of those are when genocide is committed. And as difficult as it is to categorize the different types of genocide, when I speak about this issue I categorize genocide into three types. The first and most primitive kind being a ‘hurricane of hatred,' which predates history, when one tribe descends on another and wipes them out. The second, which coincides with written history and often occurred during Medieval times involves the military encampment of a city and what couldn't be completed with swords or bows and arrows would be done through a genocide by attrition: hunger, famine, disease. The third type of which there is only one, is the Holocaust and the so-called ‘final solution.' And in this particular case it wasn't just the military apparatus and political leadership that was engaged, in this case you had the scientific elite and engineering elite, come together to commit this horror..."
"The one that seems to be missing in this grouping is the Holodomor genocide in Ukraine, which involved millions of people. It was especially horrific because Ukraine was the breadbasket of Europe. Food was being exported at the same time that the famine genocide was underway and what's especially disturbing is that there seems to be, at the present time, especially by the Russian government and Mr. Vladimir Putin, a state of denial and a revision of Stalinist history. In fact, there is a real push to glorify the Stalinist era, and that's why it makes it all that much more important..."
"Yes, it's different in certain ways. Of course, no categorization is perfect. There are hybrids, as we see today in Darfur, which started off as a regular genocide of the ‘hurricane of hatred' type that when they realized, once again, that there weren't enough bullets, they attempted exactly what Stalin was doing. They ruined the means of production and they starved the countryside to death and then allowed disease and hungry to take their toll. (...) And as I said, and I try to pull in a Canadian connection, and in this particular case, there are over a million Ukrainian Canadians in the country, and especially in the prairies they're considered one of the founding peoples. And, it helps these students in the multicultural city that we live in, to understand what the flip side of tolerance can lead to. What intolerance, hate, xenophobia can ultimately lead to." Wrzesnewskyj has worked hard to help increase the profile of the Holodomor among Canadians and his parliamentary colleagues. On June 5, 2007 Wrzesnewskyj introduced his Ukrainian Holodomor-Genocide Remembrance Day Act (Bill C-450) and on November 28, 2007 he spoke about the Holodomor on the floor of the House of Commons and later in the day during the 75th anniversary commemoration of the Holodomor on Parliament Hill. Wrzesnewskyj also hosted Nigel Colley, the great-nephew of Gareth Jones, during his visit to Parliament Hill on November 28, 2006. Gareth Jones was one of the few Western or international journalists brave enough to expose and write about the Holodomor as the terrible famine genocide was in full swing.